My day cream is empty. My facial toner is empty. Also my night cream and shampoo is empty! Time to restock my daily beauty needs I suppose and luckily I happen to have The Body Shop gift cards, a partial birthday gifts (thank you friends and colleagues!) and I’ve made good use of them! Apart The Body Shop, I’ve shopped at ‘De Tuinen’ and Kruidvat. 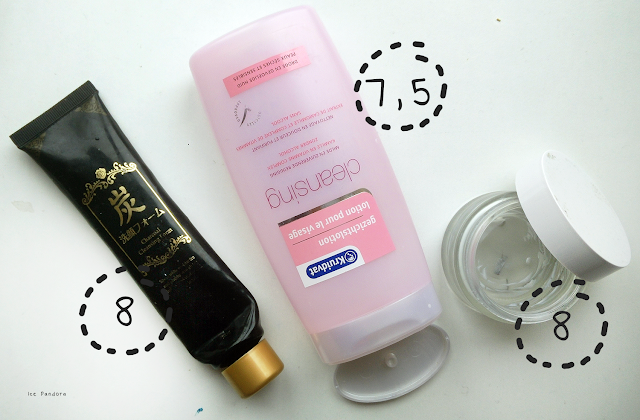 Further more: a little review about my empties too and first impressions of the new ones. Check them down below. Mijn dag crème is op. Mijn gezicht toner fles is leeg. Ook mijn nachtcrème en shampoo zijn leeg! Tijd om mijn verzorgingsproducten weer eens aan te schaffen en gelukkig heb ik een stapel The Body Shop cadeaukaarten die ik gekregen heb van lieve vrienden en collega's, en daar heb ik goed gebruik van gemaakt! Naast The Body Shop heb ik gewinkeld bij De Tuinen en Kruidvat. 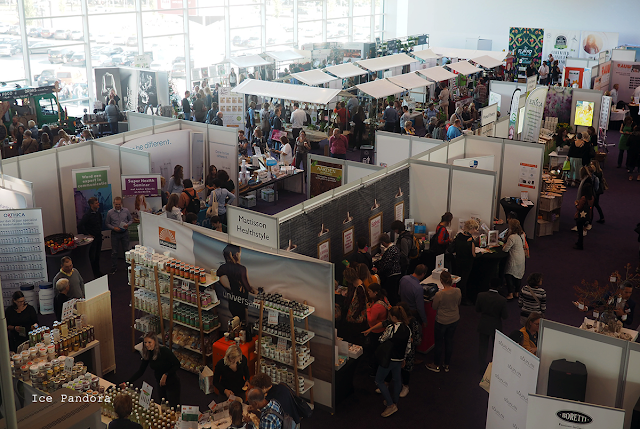 Tot slot: mijn kijk en beoordeling op de lege producten en eerste indruk van de nieuwe aankoopjes, lees ze hieronder. I've bought this at my favorite Asian 1 Dollar shop 'Daiso' and this facial wash treated me well. It doesn't lather up much but it's alright. It gave me a clean feel on my skin, no breakouts and price and quality ratio is good! Kruidvat is a Dutch pharmacy brand and they have their own product line. This toner was actually my first toner. First time using it, it kind of stings but after a few time using it in a row (only at night) my skin adjusted to it. I apply this toner on a piece of cotton path and it always leaves some dirt on it which is good. Also the toner is cheap and lasted me really long. Etos is also a Dutch pharmacy brand like Kruidvat and like Kruidvat they have their own product line too. This day cream was actually a gift. For a pharmacy brand, this day cream has actually good stuff init: SPF 8 (ok, it's not high but still, not bad!) and vitamin E. The texture of this cream is nice and absorbs quickly. Firstly, there was a huge sale at TBS and since I don't really have special request for facial wash other than cleaning my face, I've picked this Tea Tree Cool & Creamy wash for no special reason. And it was on sale too. So far it's doing a good job at cleaning my face. Tea Tree is also good in treating acne too. Another thing that was on sale was this Nutriganics Refreshing Toner. Again, I don't have special request and need in a toner so I chuck this toner without a doubt. Ok, now this cream was also on sale at Dutch health store 'De Tuinen'. This glass jar with 50ml of 100% sheabutter used to be €11 but I got it for the half of the price which is a steal. I'm using this for my night cream routine. My first time buying the brand Biodermal! I'm curious! The adverts that have shown on tv looks promising. 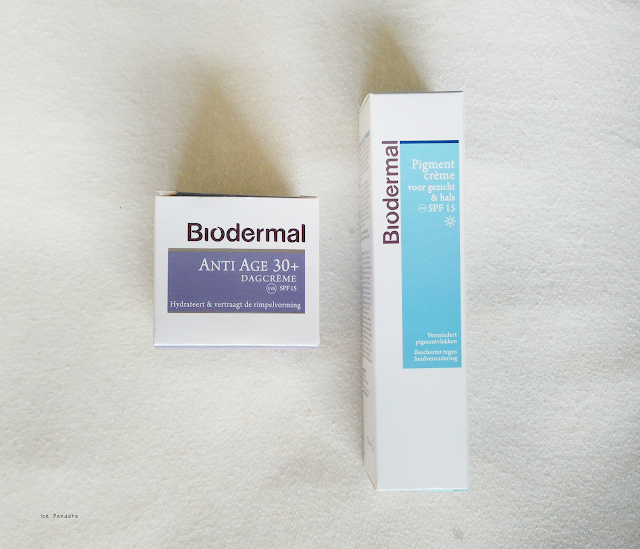 More review matter of these 2 Biodermal soon! 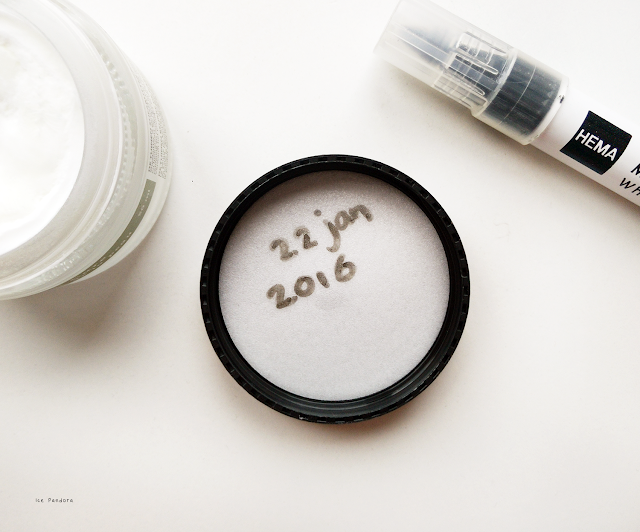 Writing down the date of when I start using a product. 100% Sheabutter in this jar and I'm intrigued. Sheabutter is known for a lot of skin benefits too and to name you a few: hydration, improves skin elasticity and cell stimulation. Also it has vitamin E and A in it! 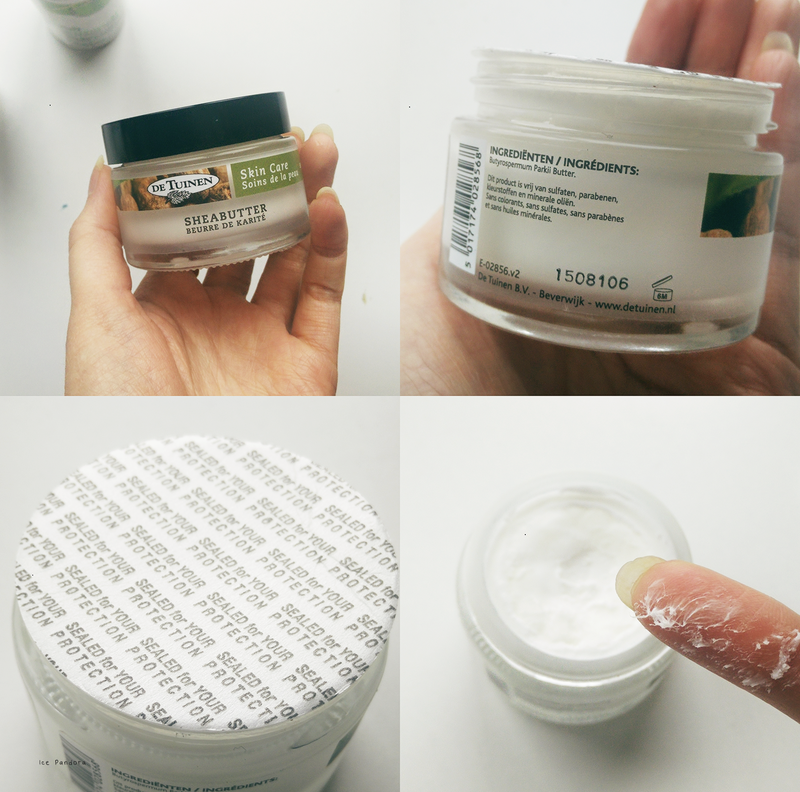 Ok the texture: it's not my usual smooth cream because you need to warm the sheabutter in hand palm first to make it smoothable. It reminds me of coconut oil but not entirely because coconut oil melts quicker than sheabutter. 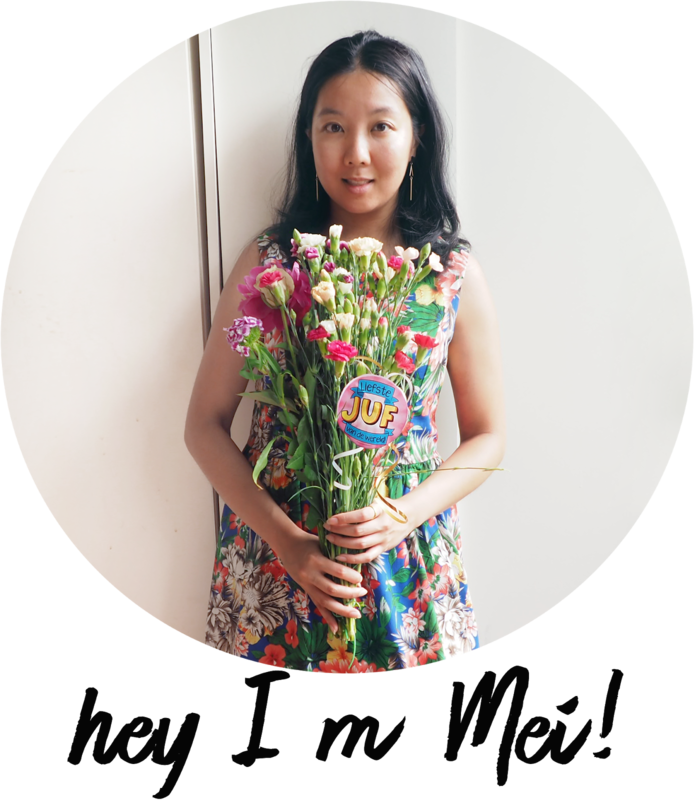 However, my first impression is very ok and everytime I wake up, my skin feels really nurtured and glowy. So far so good! As said before, I don't really have special request for a toner to be. 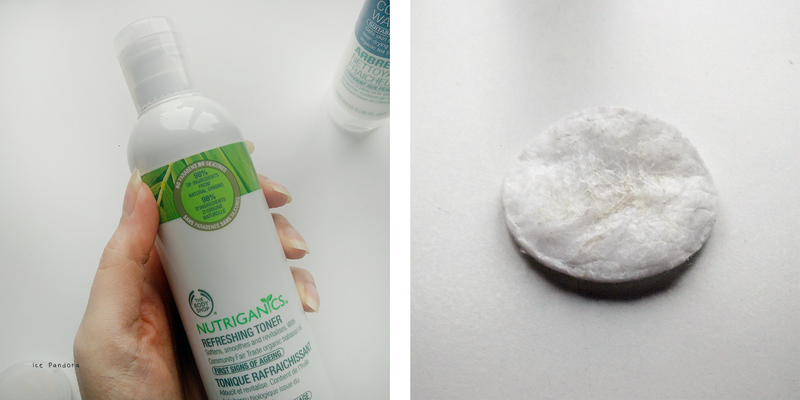 If it leaves dirt on a piece of cotton pad then I'm happy which this Nutriganics Refreshing Toner did. It also claims to have 98% natural ingredients in it and free from parabens and whatsoever. I also have read reviews from other people and they are mixed. I'm curious what my review will be after long term using it. 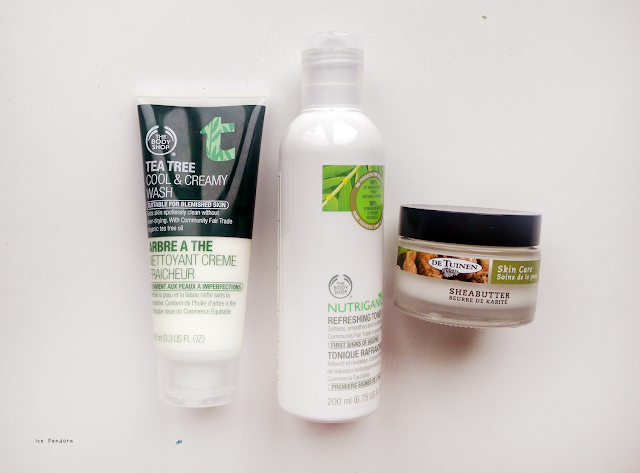 I've heard such great things about the body shops tea tree products! I love reading about what other products people use. gives me inspiration when I run out of products! I've heard great things about shea butter! Hope you enjoy the new products! Die toner van the Body Shop ziet er echt lekker uit!